The Scottish Rite is a system of Masonic degrees which elaborate and supplement the content of the three Craft degrees. It recognizes the supremacy and exclusive jurisdiction of Grand Lodges over the first three degrees of Masonry and Masonic funeral rites and ceremonies. It greatly strengthens and extends their teachings by ritual, drama, and allegory. The Scottish Rite holds that no degree has a higher value than that of Master Mason. The instruction given in the Craft degrees is, however, seldom fully grasped by the candidate. He needs further instruction and enlightenment to understand the great truths which Freemasonry possesses and which Freemasonry teaches. The first three degrees are but the wonderful entrance to the great Temple of Freemasonry. 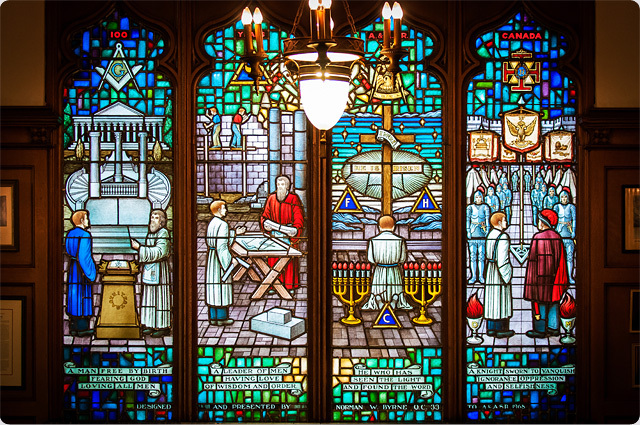 He who would seek more light, more knowledge of the mission and symbolism of Freemasonry, a more complete interpretation of the teachings of the Craft degrees, as well as acceptance into a very special fellowship and Brotherhood, can obtain these within the Scottish Rite. The Craft degrees are the ground base of Masonry. Without them, Freemasonry would not exist. The Scottish Rite builds a superstructure on this firm base, and so provides a means whereby the earnest seeker after truth may receive further and deeper knowledge and understanding of the same great truths. The whole of Canada constitutes a single Scottish Rite Jurisdiction. Here, the term "Scottish Rite" is a short form for "The Ancient and Accepted Scottish Rite of Freemasonry of Canada". Application for membership in the Scottish Rite is open to members in good standing in any Canadian Craft Lodge who are Master Masons. Continued membership in a Craft Lodge is required to maintain good standing in the Scottish Rite. Acceptance for membership is subject to the usual Masonic conditions of residence, sponsors, investigation, and ballot. Physical impairment is not a disqualification. Belief in a Supreme Being is, as in the Craft degrees, an essential requirement. The government of the Scottish Rite in Canada resides in the Supreme Council 33° which selects and elects its own membership. At its head is the Sovereign Grand Commander and it is composed of Sovereign Grand Inspectors-General, 33°, Active Members, (not exceeding 33 in number), plus Past Sovereign Grand Commanders, who are Active Members AD Vitam, and Past Active Members (without vote). Associated with them are Honorary Inspectors-General, 33°, distinguished Brethren selected for their service to the Scottish Rite, to Freemasonry, to their country, or to humanity. In summary, then, the Scottish Rite is a unique teacher of universal Masonic truths inspired by the wisdom of the ages. We first admit the candidate to the Temple of Solomon in the period inherited from the third degree. We renew the work toward the completion and realization of the Temple, and recover for the Master Mason that which was lost. In later degrees we portray events of universal significance associated with the building of the Second Temple. Still later, we are shown a way to erect the Third Temple — that Temple of Truth and Love which exists in the hearts of man when he strives to identify himself with that which is highest and best, and to which Jesus alluded in the words “Destroy this Temple and in three days I will build it up”. In a final series of degrees the history and philosophy of Masonry are developed in ceremony and drama, so the zealous Brother has an unequalled opportunity to acquire a deeper knowledge and understanding of Masonic symbolism and dogma. This is the opportunity, the challenge and the reward which the Scottish Rite presents to the Master Mason. Lodges of Perfection conferring the 4th to 14th degrees, inclusive. It is to one of these lodges that a Master Mason applies for membership. The degrees continue the story of the building of King Solomon's Temple, and amplify and conclude the legend of the Master Mason degree. Chapters of Rose Croix conferring the 15th to 18th degrees inclusive. The 15th and 16th degrees relate to the rebuilding of the Second Temple by Zerubbabel. The 17th degree is an approach to, and the 18th degree a recognition of the Christian ethic, but in universal terms, thus assisting in the building, in our hearts, of the Third Temple, not made with hands. Consistories conferring the 19th to the 32nd degrees inclusive. These degrees, often elaborate and highly dramatic, cover a variety of approaches to Masonic teaching. Some have the Crusades as a background. The 30th, 31st and 32nd degrees culminate the teachings of the Scottish Rite, and must be conferred in full ritual form.